Since 1975, the Mercedes-Benz Superdome has played host to some of the most memorable moments in music, including the Rolling Stones in 1981 and the Ultimate Event Tour featuring Frank Sinatra, Liza Minnelli, and Sammy Davis, Jr. in 1989. The Superdome also serves as the host site for the annual Essence Festival, which boasts as many as five shows performing simultaneously on different stages within the Superdome. More recent acts that have taken the big stage include: Kenny Chesney & Tim McGraw, Beyoncé & Jay Z and One Direction. 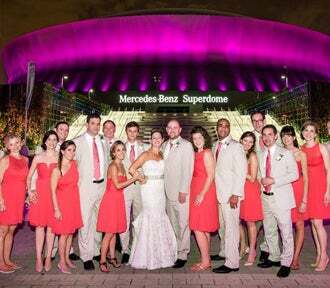 From concerts that have set attendance records to small private performances, the Superdome adapts to fit your needs and provides an experience that proves our venue is the place where the performance never ends. Everything you need to know about the venue is found here. Browse through site maps, facility specifications, back of house space layouts, etc. This is an application required for first time users interested in using the Mercedes-Benz Superdome for a ticketed concert. Please complete this form and submit via [email protected] for consideration.